Whilst driving into work this morning I had a few “shake my head in disbelief” moments. First up were the drivers who failed to switch on their headlights. It was pretty dark as dawn hadn’t yet woken up. I’m amazed at how many people fall into this category. That is no headlights, not the woken up bit. I can’t decide if it’s just because they can see everyone else coming with their lights on so they don’t have to worry. Or maybe it’s down to them actually sleeping at the same time as dawn, perhaps even with dawn. It could of course simply be that they just don’t care, and as a consequence are just too daft to understand the need to switch their lights on. I’m not sure, but what I do know is I found myself shaking my head from side to side in disbelief. Either way, it was turning out to be pretty dangerous. 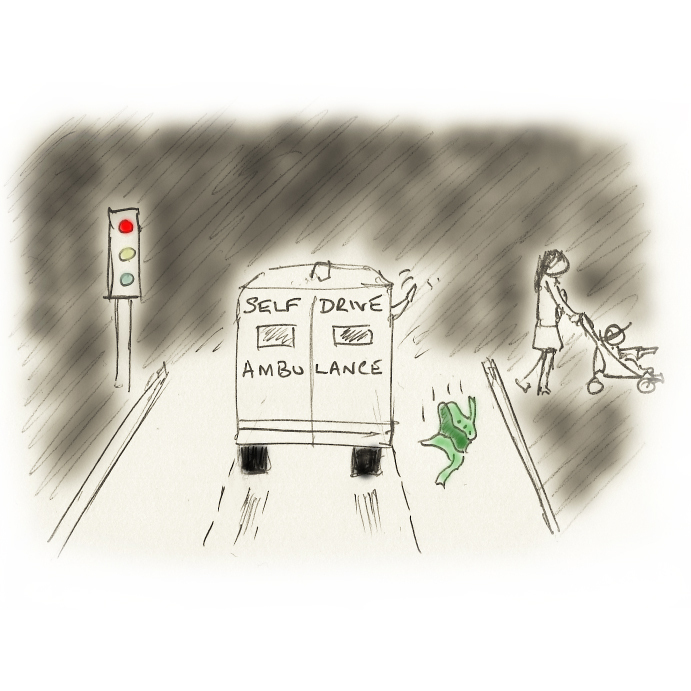 I saw a young woman crossing the road whilst pushing a child in a pushchair. Now this doesn’t sound too risky does it? Well I’m afraid to say it was and it was pretty irresponsible in the manner that she did it too. It all happened at a busy crossroads that is controlled by traffic lights. When used correctly it is perfectly safe to cross, even with a child. As I approached the junction the lights turned red. So naturally I stopped, as did the vehicle in front of me. So just as well I did really. I then noticed that the traffic in every direction had stopped. That’s it, we just sat there, motionless. Then the reason came to light, a loud repetitive audible “beep” could be heard. This of course is for the pedestrians to cross safely in any which way they desired. After all, they pushed the button. Oh, hang on a minute. No that’s not right, they’ve crossed already! Why do people do that? Once again I found myself shaking my head from side to side. She had risked her own life and that of the child. She had acted responsibly in pressing the button to clearly demonstrate to the child that it’s the correct thing to do but then proceeded to do something else. Not only did she risk their lives by playing Frogger but it could have resulted in potentially devastating an innocent driver who could have been caught up in it all. She did make it safely to the other side and fortunately with her child. The worse that had occurred was that she’d managed to frustrate the early rush hour drivers by forcing them to wait for absolutely no reason what so ever. Maybe there should be a cancel button on the other side of the road? No, best not. I can foresee that matter turning into more trouble than it’s worth. Better leave that idea alone for now. You see, the vehicle in front of me drove slower than I can run, and believe me I don’t run very often or anywhere near Olympic speeds. I found myself saying things like “if you drove at the usual typical speed for this road you could have an extra 15 minutes in bed”, maybe even with dawn. Who knows. I shook my head in disbelief. Eventually I reached a three lane road and went on my merry way. Then once again… this time in the middle lane, was an ambulance travelling at about 40mph. Now there could be a very good reason for this reduced speed on a 70mph road but why the middle lane I wondered? The inside lane was clear. Not a driver in sight. No one dared to pass on the inside of the ambulance as the law clearly doesn’t permit it. So one by one we squeezed into the outside lane to drive on past. It was at this point I shook my head in disbelief once more. The ambulance driver was taking off their official green jacket! Yes that’s right, whilst driving an ambulance in the middle lane at an awkward speed he was irresponsibly risking the lives of many others by getting undressed! I tried to forget about all of this and settle down for the remainder of my journey. After all, my head was starting to hurt with all of the sideways shaking. So after all the build up of these stressful incidents I longed for something to make me feel better. Something to calm my body down for readiness of a hard day’s work in the office. Just a little chuckle would do, or perhaps a curious thought. Wow! Really? That’s very clever, especially in the dark. This entry was posted in Out and About, Travel and tagged Cajuzi, Clever, Dawn, Driving, Risks. Bookmark the permalink.